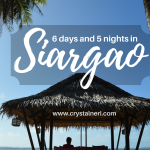 HERE ARE MY TOP 10 fantastic experiences traveling solo to Surigao Del Norte for 3 Nights/2 Days. 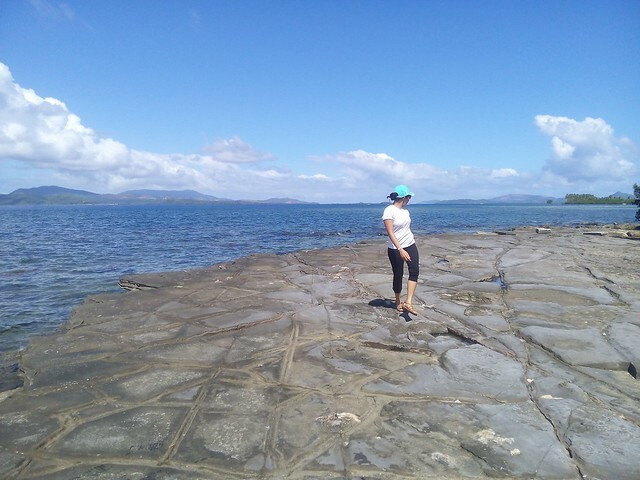 After seeing pictures of Mabua Rock and Stone Beach in TripAdvisor, I thought it’s just one of those that’s interesting but not very pretty. I was wrong. 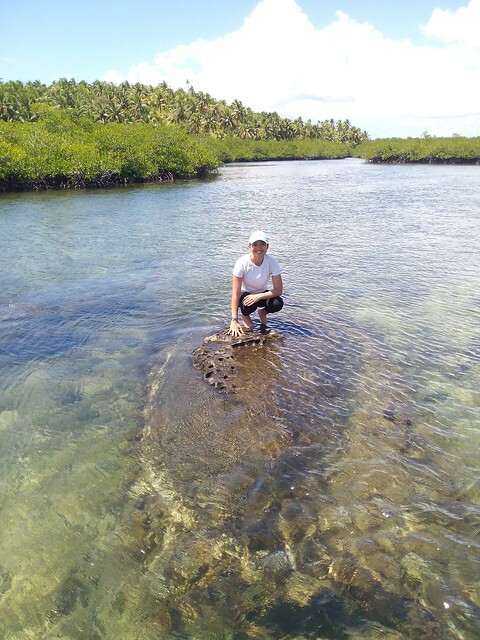 When I arrived, I stood on perfectly smooth and round pebbles with calm, clear and clean ocean views in the background – it’s as fantastic of an experience you can get in Surigao Del Norte. I didn’t plan on swimming, but now I see why there are dozens of cottages built along Mabua Pebble Beach – there are only a few places you can both call unique and pretty. I said a little prayer hoping it stays the same way as it is now. It’s a real must-see. 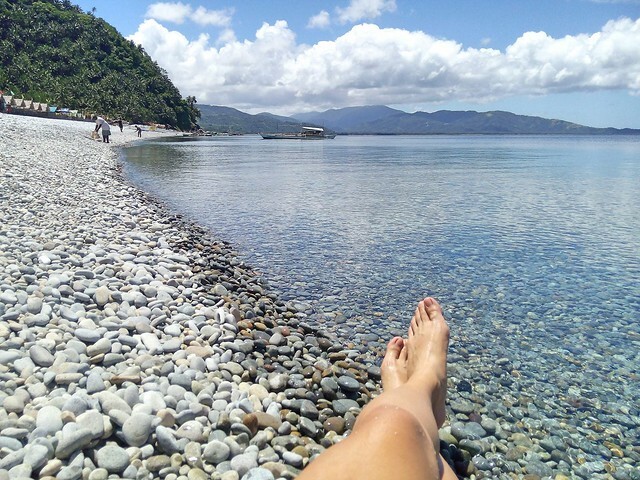 Notes: If you’d like more privacy and better views, I recommend going over to Looc Beach, a hike or a few minutes tricycle drive from Mabua. 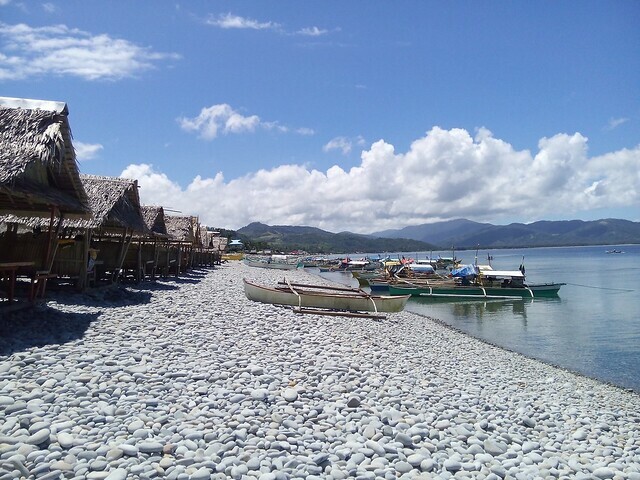 Both pebble beaches are just a convenient 30-minute tricycle ride from city proper. 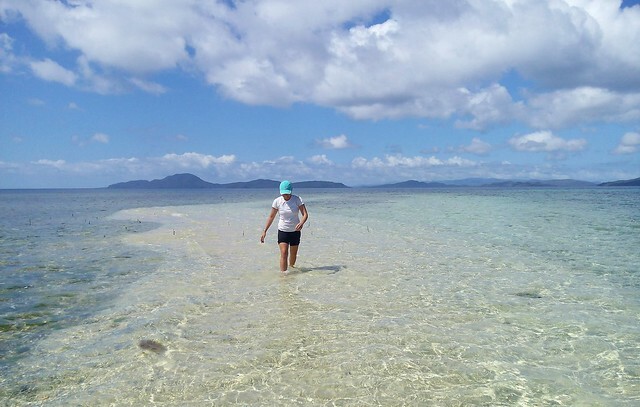 Long before I arrived in Surigao City, I’ve made up my mind that Day-asan is not for me. 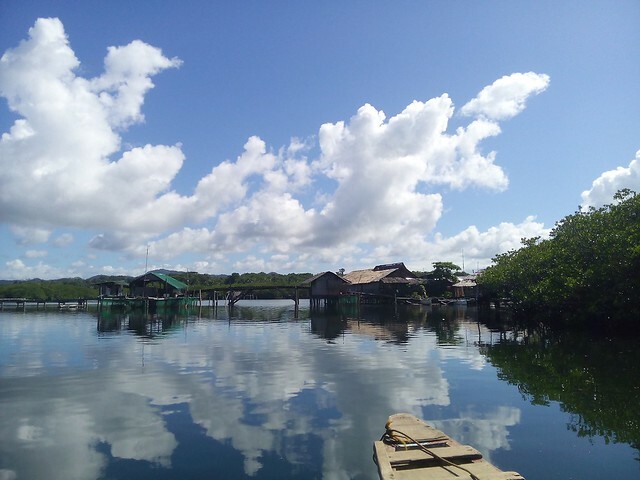 What’s to see in a water village? A lot, especially if you have a tour guide as expert as Julito. 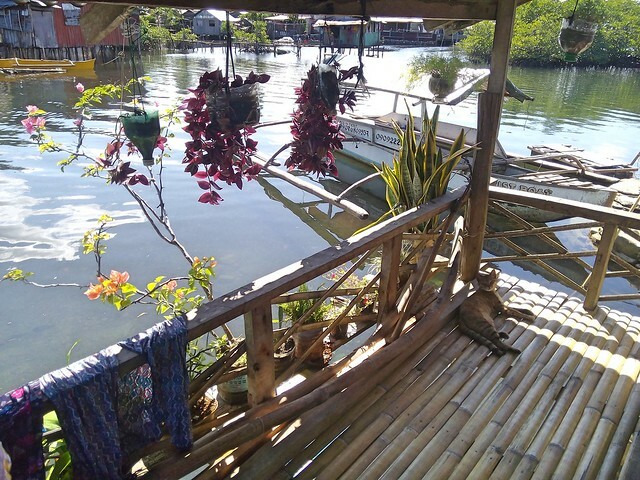 In the kindness of his heart, he opened his home to me – two small kubo (cottage) built on stilts over water, built by him and his father. 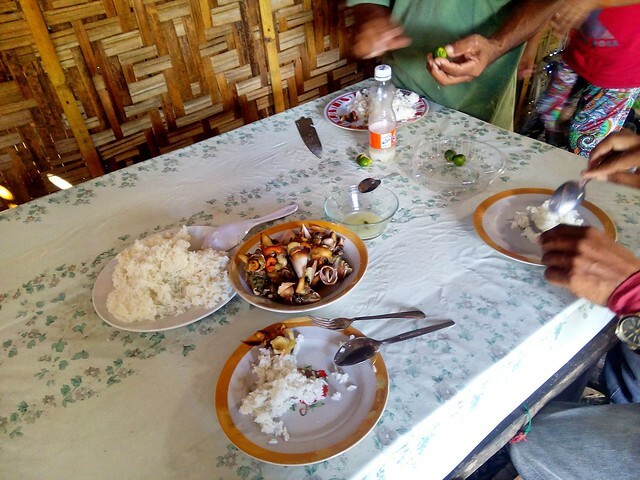 For lunch we bought P80 worth of saang, a type of shellfish easily available to the townsfolk. 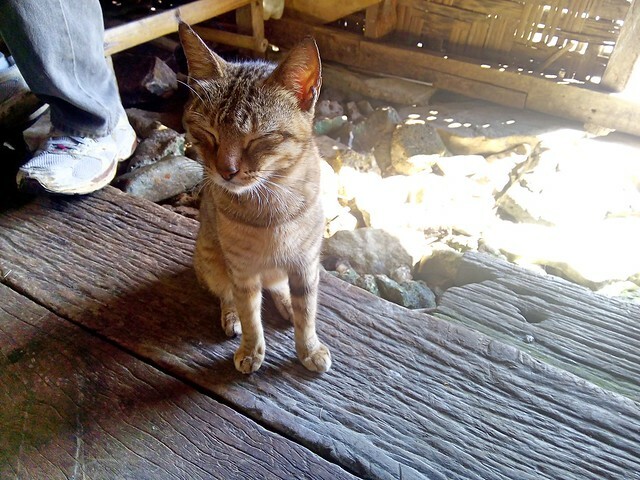 His wife boiled it a bit with salt and we ate it with vinegar, chili pepper and calamansi. I asked Julito and my tour guide Alan to join me while eating. In big cities like Cebu, you can easily spend P300 on a medium-sized meal and still feel not full. With the simple spread in front of us, just seafood and rice, we had aplenty. No desserts necessary. 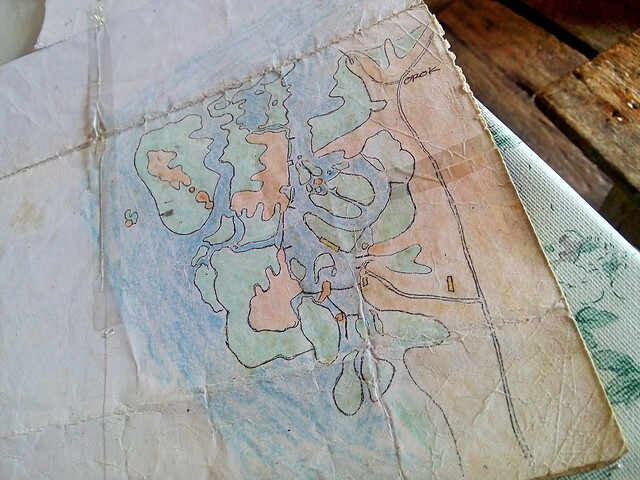 Julito drew this map of Day-asan by hand. 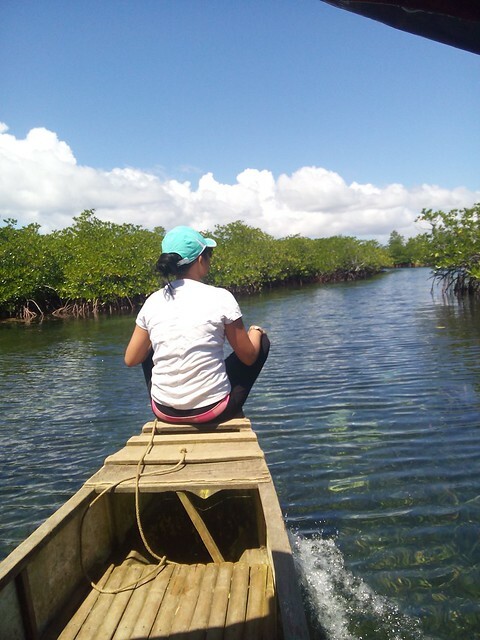 Green areas for mangrove forests, Orange for land. 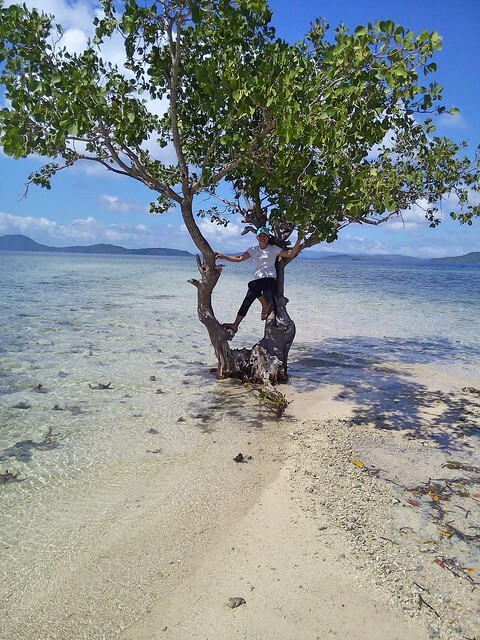 On my ride from the airport to Parkway Hotel, I asked my driver what to do in Surigao Del Norte. He referred me to a a tricycle driver friend of his, Allan. The next day, I met Allan and and instantly knew I could trust him. 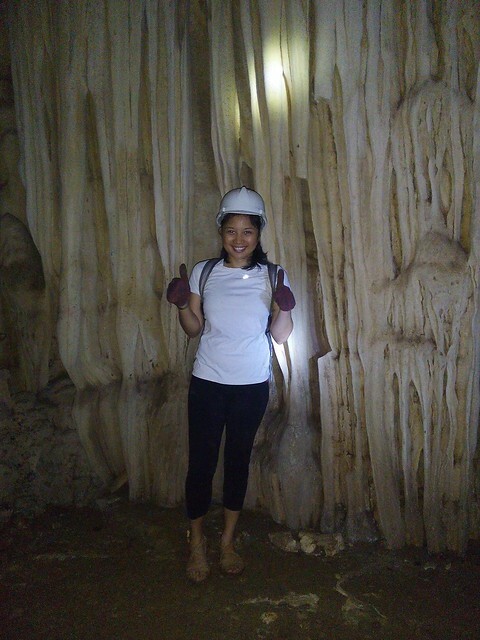 For P1500, I got a day tour of Silop Cave, Mabua and Looc Beaches and Day-asan Water Village. 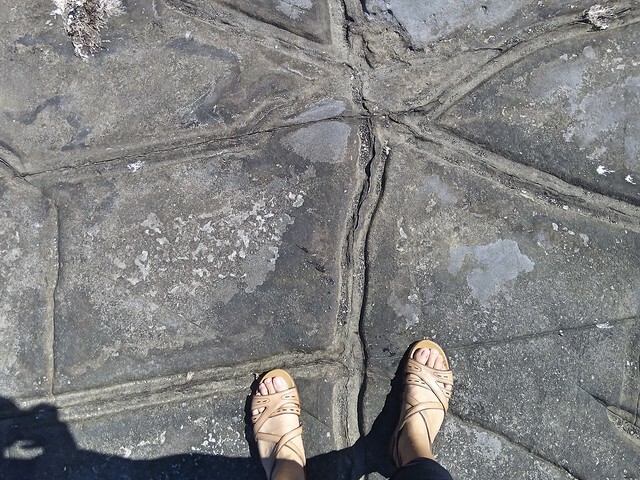 At first I thought it was overpriced, but Alan went with me everywhere – caving, boat tour and even took longer routes to show me other tourist spots. 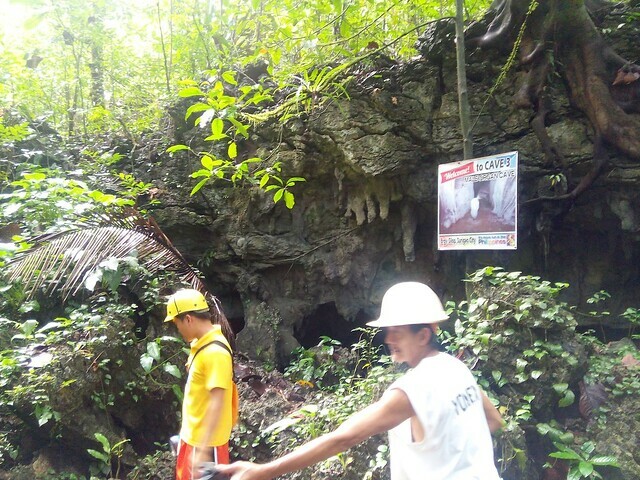 He made sure I was taken care of while inside Silop cave, referred me to Julito and gladly took all of the pictures you see in this blog. I invited him to join me for dinner in Babet’s BBQ near the pier. I like that Allan spoke very good Tagalog. 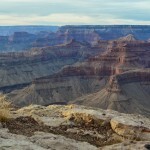 I felt taken care and safe, which made my trip all the more memorable. 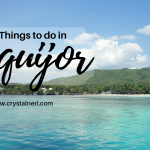 Silop Cave happens to be the most popular in Surigao Del Sur because it’s just a 20-minute drive from the city, but there are other ones like Mapawa Cave and Buena Vista Cave that is just as impressive but far. I enjoy caving because its one of those experiences that’s more inner than outer (unless you have megabucks for lighting and photography equipment). Naturally, Silop Cave was a must for me, but I did not expect the caves to be as massive and expansive as they turned out to be. The entrance fee is P100 plus P200 for the tour guide. I was there early and had all the caves to myself. 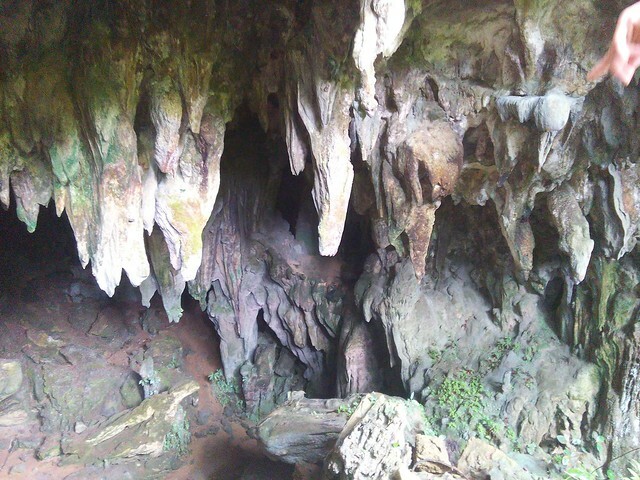 There’s thousands of bats in Silop Cave #2. You won’t be able to see them very clearly but you’ll hear violent swarms of wing sounds. 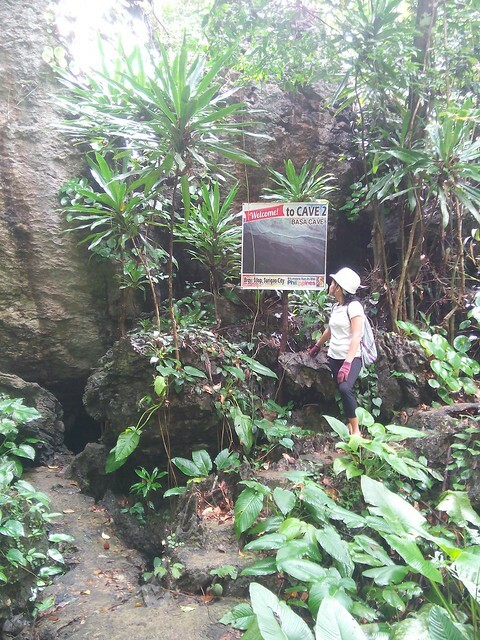 A few minutes later, I saw a small gray snake (called Black Cobra) in the first cave. Walked past it; not a problem. In cave #3, snakes were not only bigger, but more. I wouldn’t be as afraid but the biggest snake had its head up as if ready to attack. I clutched my guide’s arm tightly as we slowly walked past two black cobras. 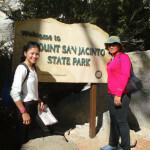 Before we went in any of the caves, the father and son tour guide said a prayer: “Guide us as we enter these caves. 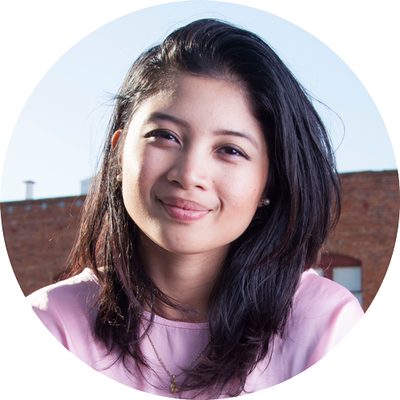 We are just visitors, so please grant us safe passage.” A few moments later when I was rappelling down a 25-foot dark, slippery entrance, I prayed again for all of our safety. Seeing the light near the exit of the cave is much better than getting out of a Bikram yoga session after 90 minutes – all you’d want is to get out of there. Tarantulas are common in these caves, but I didn’t see any this time. Instead I experienced being two-inches away from these spectacular pillar (when stalactites and stalagmites meet, usually taking 125 million years). 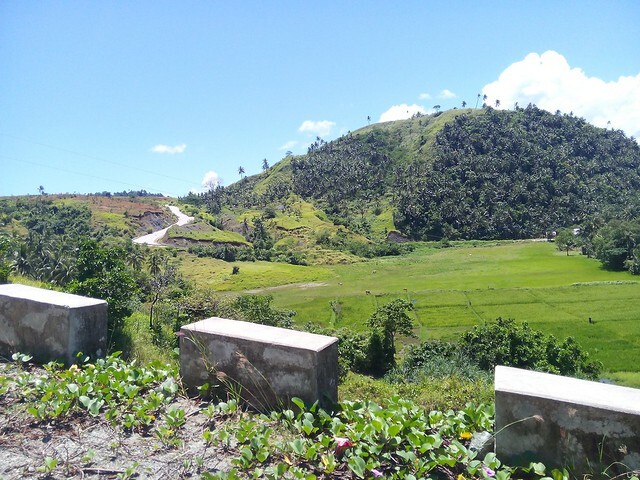 I was literally deep into northeastern Mindanao. I didn’t really know what I was doing there alone, but now that I’m back in my comfy home, all I’d ever want to do there if I go back is to take the mandatory 2 days to explore all of Silop’s 12 caves. When I was living in San Francisco, riding the Muni made me understand the geography of the city. A few years later when I moved to Cebu, riding the jeepney also familiarized me with streets going to SM and Ayala. 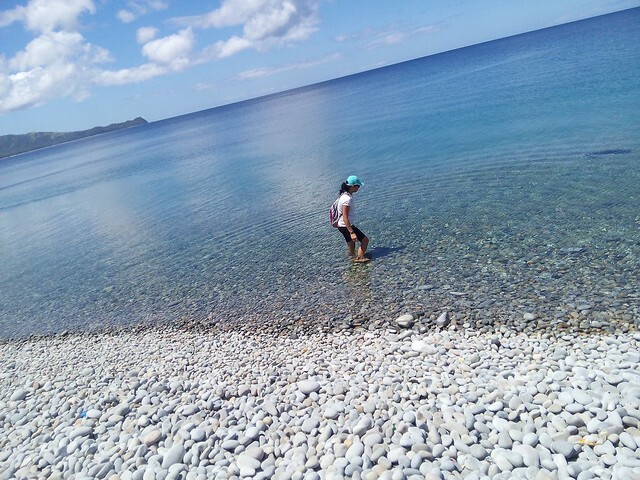 It’s the same in Surigao. I took a jeepney from Parkway Hotel (where I was staying at) to Luneta Park for P8. After a rountrip ride, I was able to look at my map in confidence and figure things out. 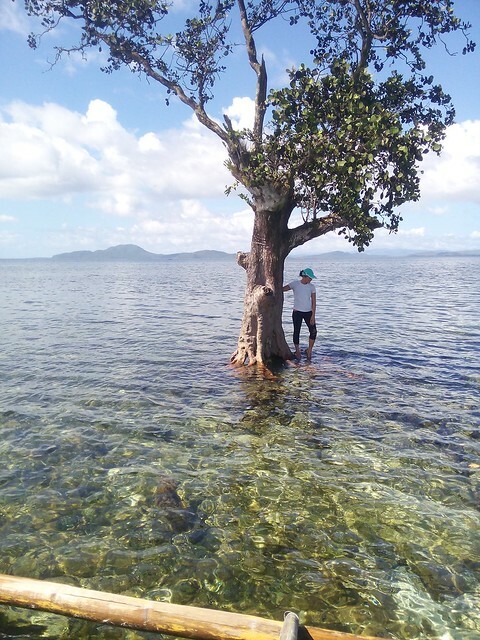 Surigao Del Sur’s Luneta Park is a must-see and very accessible from any point in the city. It’s just walking distance from the public market. I went inside Surigaonon Heritage Museum and right across is the Tourism Center where I grabbed one free map. The park is clean and filled with people, so I wanted to sit and people-watch, but in the corner of my eye I saw a foot reflexology station. I ended up going back there twice feeling energized after each session. Before my trip, I asked a friend of a friend (Thank you, Glynis!) 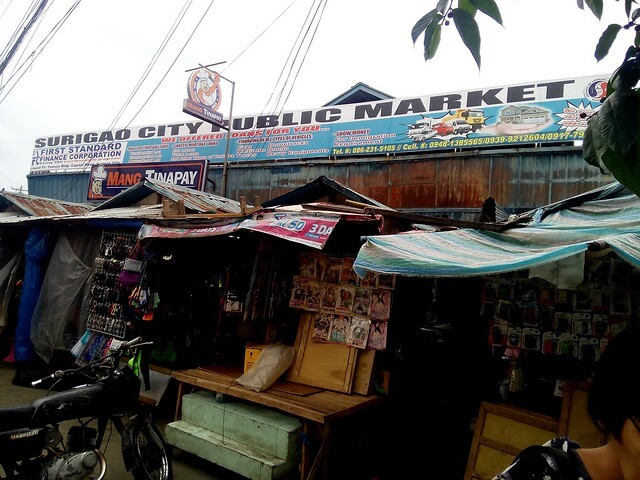 for recommendations on where to eat in Surigao. I ended up in Ocean’s Bounty at the wet market. 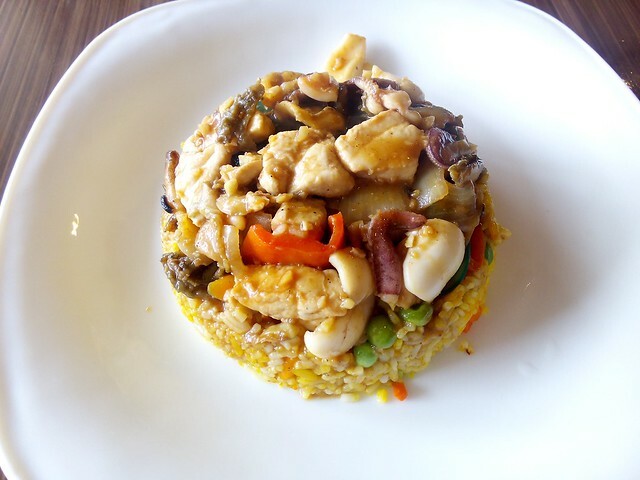 I ordered the seafood paella for P120. For a moment, I channeled a little Liz Gilbert in Italy eating Napoleotan pizza. My eyes and tummy were delighted. 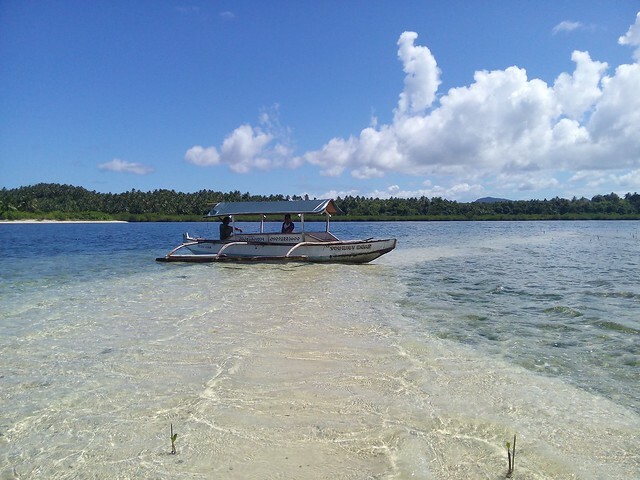 At one point, on my way back to the hotel, sitting in the tricycle and basking in the late afternoon sun of Surigao, I realised how brave I’ve gotten. If I stayed comfortable and safe in my house, I would have saved money. I would have been less stressed. But the whole point of getting out there on my own was to push myself and pursue my love of adventure. It’s not extreme, like a woman swimming from Cuba to Florida or a man running barefoot from California to New York, but it’s still an exploration true to my own reality. Just being able to do something by myself, without anyone’s help (even my own husband’s) does nothing but empower me. And I know that with these little achievements, I can count on going further later on. 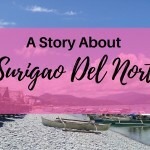 Have you been to Surigao Del Norte before? Let me know if you have any travel stories or tips to share in the comments section below. Diary Of A Reader has a free newsletter once every two weeks. It comes out on Sundays and offers updates direct to your inbox. No spam, ever.